Volunteers - Conserving Carolina - For Nature and People. Forever. Our volunteers have fun, make friends, and make a huge difference. Whether you’re building trails, restoring wildlife habitat, helping with an event, or assisting in the office, we couldn’t do it without you. There are a number of regular volunteer crews you can join (see descriptions below) or check out upcoming workdays on our calendar. To stay in touch, sign up for our once-a-month volunteer email. Trail building and maintenance | Invasive plant removal | Special events Tabling and outreach | Education | Office assistance | Litter cleanups Conservation easement monitoring | Water quality monitoring | and more! Do you have a group that would like to volunteer with Conserving Carolina? We love working with groups. Please contact us at volunteer@conservingcarolina.org. Please track your volunteer time! This helps us in many ways, including securing grant funding to support our work. Volunteer Hours Served in 2018. Thank You! The Kudzu Warriors are a group of dedicated volunteers who meet on Mondays from 8-10AM to eradicate kudzu and other invasive plants at Norman Wilder Forest in Polk County, off 176 between Tryon and Saluda. They’ve made a tremendous impact on this Conserving Carolina-owned nature preserve. Areas that were once a mat of kudzu vines are now lush with native vegetation. But the fight is not over, and we need your help! 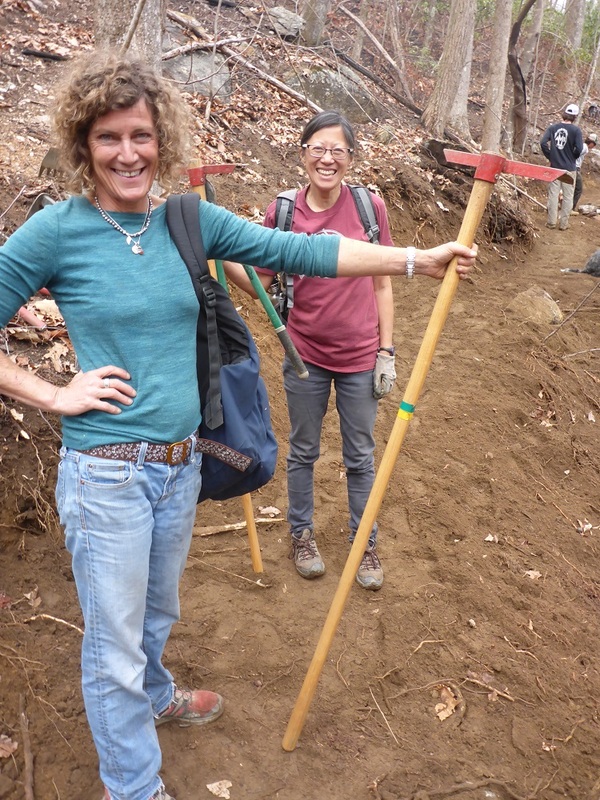 The Rock Crushers are a regular volunteer crew who meet work weekly workdays on Wednesdays to build and steward Conserving Carolina’s public hiking, biking, and climbing trails in the Hickory Nut Gorge. The Rock Crushers are a close knit group with a lot of energy. They move rocks, sling tools, dig tread, remove vegetation, and more—having fun while working hard. Every Thursday beginning at 8AM, our volunteers get together at the lot next to the Tryon IGA, clearing invasive species and restoring native habitat. The goal is to clean up this close-to-town property so that it can be used as a recreational area, like a picnic space. We hold regular stewardship workdays on Fridays at a range of locations throughout our region, including nature preserves, working farms, and unique Appalachian bogs. At the end of the day, you can look back and see the difference you’ve made to restore vibrant habitats for native plants and wildlife! Volunteer with the Friends of Brevard Area Trails! A program of Conserving Carolina, the Friends of BATS enhance local trails, including the Brevard greenways system and Bracken Mountain Preserve. Volunteer opportunities include breaking ground on new trails, maintaining trails, cleaning up litter, and otherwise enhancing trails, greenways, and blueways. A program of Conserving Carolina, the Transylvania French Broad River Stewards help keep the river beautiful, healthy, and a vibrant part of our local economy. Volunteer opportunities include river clean-ups and water quality monitoring. This grassroots group also holds the annual River Fest in Rosman, improve public access to the river, and alert paddlers when there are logjams or downed trees.